After nearly a half year hiatus I’m Famous! (not in Japan) is back! I actually wrote this (and the next 5 or so) back when I wrote all the other ones, I just never drew it. Why so long? Because I was focused on Two Drink Minimum and wanted to let Rawr have the spotlight with our foray into Manga land. So why now? In truth, it’s because the next scene of Two Drink Minimum needs to be rewritten to incorporate a new idea, and Alex is taking some time to do it. Also I missed drawing it. So you get some knew Famouses! And what a Famous to come back on. The iconic Hollywood sign! I really like this one and that final panel of the Lone Wolf towering over the sign. It was very interesting to jump back in, the only thing I’ve done besides TDM for the last 6 months was the APE comic and the start of the Famous in Japan. So from atmospheric urban black and white to bright and cheery color. And it was really easy. It was like I never stopped. And I’ve got to say, this is so much easier to draw then Black Snow, for a number of reasons. 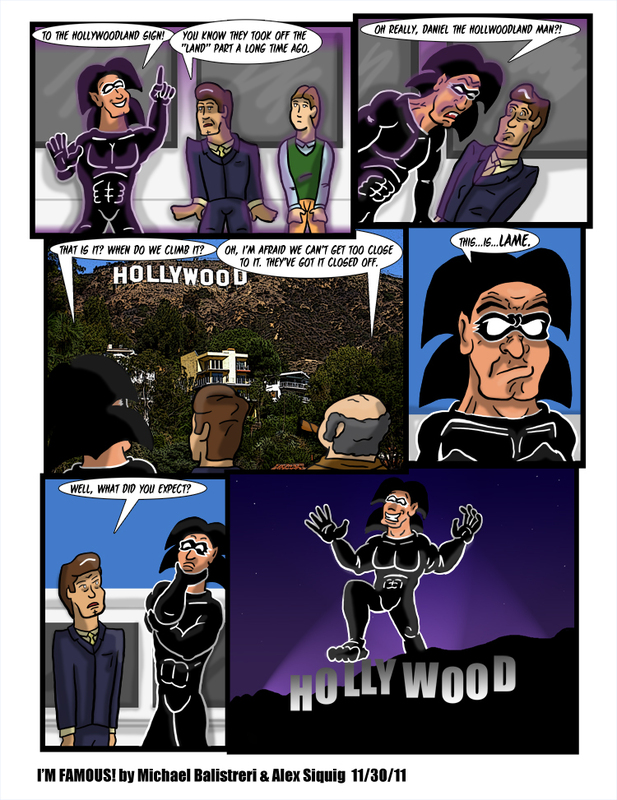 I missed just doing a silly comic strip and not working on a larger narrative driven graphic novel. It takes a lot less time too. So it was really fun. I could go on about the differences and similarities between working on the two, but I fear I’d just bore you since it is a fairly personal experience. Instead lets talk about this beautiful comic above. I tried a couple of new things here, light the Lone Wolf’s mask outline, the characters eyes, and some other small things, and I’d say only about half of them work. So I’ll likely not be repeating a few of the scenes you see here. But at least that means half worked, and I think overall it looks good. I really like the Lone Wolf’s pouting close up! You might notice I used my photographic tricks for that Hollywood sign image. I think it looks pretty cool. Also, you might recognize that imagery from the bottom right panel, as I based it off of a pretty iconic image. A few words about the Hollywood sign. I’ve seen it several times, as I’ve been to Hollywood on a number of occasions, and I must say it is…lame. It’s not really that big or impressive. It’s kind of cool since it is so well known and engrained in our psyches. But when you really look at it…meh. I’ve scene similar signs in other places that aren’t famous, like the “South San Francisco: The Industrial City” sign I often drive past on the freeway. So if you come to LA on a site seeing tour don’t be disappointed, because I forewarned you. 2 Responses to "I’m Famous! 108 and the Hollywood Sign"
It’s great to see the return of I’m Famous! Let the silliness continue! You can never have too much Famous!